A young Catholic priest, Oh Soo Min (Yun Woo Jin), lost his mother who was possessed by a demon years ago. Since then, he decided to become an exorcist in order to cast out demons from this world. Oh Soo Min learnt how to perform exorcisms from his mentor Priest Moon Ki Sun (Park Yong Woo) who founded 643 Regia, an unofficial club of exorcists. Meanwhile a girl named Ham Eun Ho (Jung Yoo Mi) became a doctor to save people’s lives after her family went through an unfortunate accident. 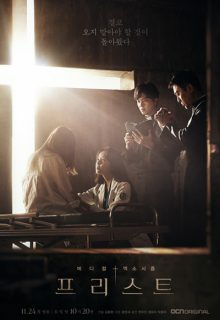 She does not believe in supernatural forces until she witnesses of a supernatural phenomenon in the Catholic hospital and meets Oh Soo Min. Together with Soo Min and Ki Sun, the heroine will fight the evils that have returned to this world again. Airs on Saturdays and Sundays.